But the second “casualty” of the crash was her black Labrador Molly, who ran away in fright – leaving her litter of puppies and their dad Mylo in the car. Molly, a black Labrador, took off from her owner Lisa Prichard’s silver Ford Fusion when the collision occurred around 9.40am on Sunday morning on the A82 near Corran Ferry. Mrs Prichard’s concerned family, all based in Milton Keynes, took to social media to widen the search for the missing Labrador with over 300 people sharing the appeal launched through the Bring Molly Home Facebook page. Stacey Prichard, Lisa’s daughter who set up the Facebook page, said: “I can’t believe it. It has been a crazy 24 hours and we are just so thankful for everybody. 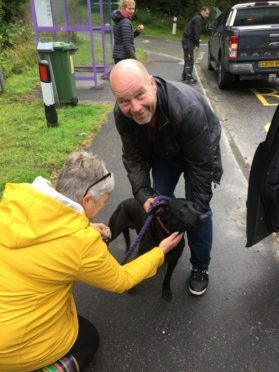 Molly’s puppies and mate Mylo were taken into the care of vets in Oban as the search for the black lab rolled out, with Mrs Prichard’s husband Paul travelling up from his home in Lincolnshire on Sunday evening to help locate his beloved pooch. The couple are in the middle of relocating to North Uist. Ms Prichard added: “My dad left at 9.30pm on Sunday night and arrived around 6am. My sister Rachael and I kept him informed with all the information and there were even a few locals out looking at that time who went and met with my dad. “I am definitely going to be visiting soon to thank everyone, and maybe arrange something in a community hall, a thank you party or something. Molly was found by local Fiona Gunn yesterday close to the crash scene. Mrs Gunn said: “I stopped, put my hazards on and opened the door, and she jumped into the car. “The dog was soaking and looked quite stressed. Molly and her puppies did not sustain any injuries in the incident, with Mylo suffering some minor cuts. All are said to be recovering well. Mrs Prichard, who was the sole occupant of the car, was taken by ambulance to the Belford Hospital in Fort William. She underwent surgery yesterday at Raigmore Hospital in Inverness on injuries sustained in the accident. Her condition is said to be not life threatening and she is expected to make a full recovery.